You’ve decorated trees before, but how about decorating a card with a Christmas tree? 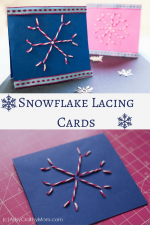 Yes, that’s what we’re doing in our Easy Christmas Tree Lacing Cards! They say that technology has made life easier. Can’t argue with that, especially if you consider how long it would have taken for a pigeon to send your message across! But the fact is that technology has also made several things obsolete, especially personal communication like writing letters or sending cards. I honestly think eCards are way too impersonal!! Do what you may, they just can’t compare to the charm of a card that you can hold and feel. And when that card is handmade too, then it’s perfect! Whether it’s a sophisticated 3D card, a simple painted card or even just a printable card, a lot of love goes into the time and effort spent on each card. 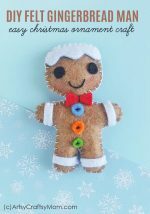 And with the holiday season in full swing, it’s the right time to swing for traditional, handmade Christmas Cards! 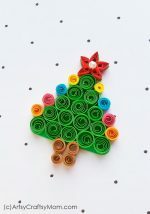 And we’ve got a pretty unique one for you today – a Christmas Tree lacing card! This is going to be one fun project! 1. First thing to do is get our base ready – the card! 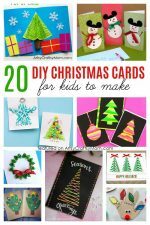 Fold your card stock into half to make a card and cut away any uneven edges. 2. Okay, time for some Math stuff! Draw an inverted V, so that the top of the inverted V lines up with the center of the top edge of the card. Make sure the two sides of the V are of equal length. 3. Take out your ruler and mark points on either side of the tree, equidistant from each other. This needs to be done carefully, so that the points on one side are exactly opposite to the corresponding points on the other side. 4. Use your punch to punch holes at each point that you’ve marked. The hole shouldn’t be so big as to be visible, but it shouldn’t be so small that the lacing string can’t pass through. 5. Time to start lacing! Start at the very top, threading the string through the hole and tying a knot underneath so that it stays put as you weave through the punched holes. String the lace to the next hole on your left and bring it out through the first hole on the right. Work your way all the way down to the last hole on the left. 6. Bring the lace up through the last hole on the right and move diagonally upwards, crossing all the lines you made with the lace in the previous step. As you reach the top most hole, pass the string under the card and knot it. Cut away any excess. Gently erase any visible pencil lines. 7. Decoration time! So your basic tree is ready, but what’s a tree without a star! 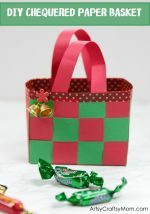 Fix a star sticker on top, or decorate the sides with little dabs of paint. I personally love little festive cut outs like snowflakes! For a change, it’s fun to decorate something with a Christmas tree than the other way round, isn’t it! 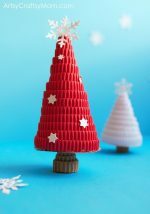 This Christmas Tree lacing card is one of those projects that’s actually not that hard but looks like you spent hours on it! What better way to let your friends and family know how much you love them!